Welcome to the Hotel Mira Vista Berkeley North. Find our lowest rates and availability right here on our website. 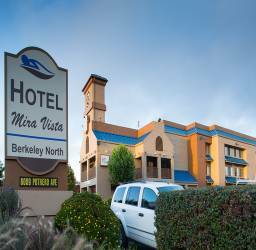 The Hotel Mira Vista is conveniently located next to Berkeley, El Cerrito, and Oakland. Our 100% Non-Smoking, Berkeley hotel is the perfect place for you to stay during your visit to UC Berkeley and San Francisco. Located only minutes from the UC Berkeley allows for quick and easy access to university events such as graduation and Cal Bears sporting events. Families benefit from being within a short drive to San Francisco and all of its attractions including Fisherman’s Wharf, Golden Gate Bridge, Alcatraz Island, and much more. 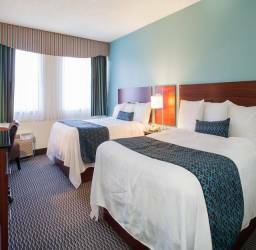 Stay in comfort and enjoy the accommodations of home when you stay at our Berkeley hotel. All of our hotel rooms include microwaves, refrigerators, flat-screen TVs with premium channels, hairdryer, Wi-Fi, coffee maker, work desk, iron/ironing board and much more. Our hotel provides accommodations for a variety of travelers, from those on a business trip to a family vacation. The Hotel Mira Vista in Berkeley offers rooms with 1 King Bed as well as those with 2 Queen Beds for larger parties. 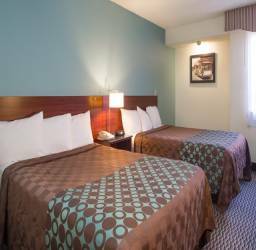 The hotel also accommodates travelers with accessible needs which feature a roll-in shower, safety bars, telephone with amplifier, and wide doorways in addition to the amenities included in our other rooms. The Hotel Mira Vista in Berkeley provides free high-speed Wi-Fi throughout the hotel for all guests, additionally, complimentary parking is available in our parking lot, and guests enjoy free breakfast daily, so start your day off on the right foot when you travel to Berkeley. It doesn’t stop there, guests staying at our Berkeley hotel will also receive daily housekeeping, restaurant delivery service, early check-in, copy service, wakeup calls, late check-out, ice machines, and vending machines. Of course, if there’s anything else you need, please contact our kind and courteous staff available around the clock. Berkeley and the surrounding areas are full of fun and exciting things to do for the whole family. You’ll want to plan your trip ahead of time to enjoy some of Berkeley’s top attractions such as UC Berkeley, Six Flags Discovery Kingdom, Golden Gate Racetrack, Jelly Belly Factory, San Pablo Lytton Casino, Oakland Zoo, and Jack London Square. Located just across the San Francisco – Oakland Bay Bridge are even more Bay Area attractions including Fisherman’s Wharf San Francisco, Alcatraz Island, Coit Tower, Union Square, San Francisco Cable Cars, Golden Gate Park, and Golden Gate Bridge. El Cerrito is located just north of Berkeley. 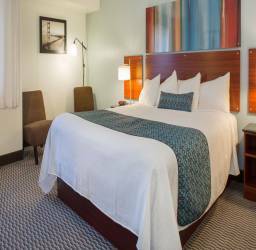 Our Berkeley hotel is ideal for corporate travel, a weekend getaway, families visiting students at UC Berkeley, and family vacations. Our convenient location puts you within close proximity to a variety of San Francisco Bay Area attractions as well as a number of businesses, including Silicon Valley. Award-winning restaurants featuring a number of world-renowned chefs are also at your disposal. We look forward to hosting you and your family during your next visit to Berkeley.